Where do we start with Lake Bled!? It is one of the most peaceful and relaxing places we have ever been, but on the other hand we have never had so many early wakeup calls or walked so far each day on a trip. Let’s just say this place is a little slice of magic. It’s breathtakingly beautiful from every angle and it’s somewhere we will be visiting again, hopefully in the near future! Not because we missed out on anything, five days was enough to explore and have some down time too, but because we truly fell in love with it. Head over heels in love. While we were in Bled we stayed at House Klasika, an adorable and perfectly located guest house. It was extremely homely, and they served free pastries throughout the day – what more could you want? We would 100% recommend staying here because the facilities are so lovely, only thing to be aware of is its cash only on departure, which many of the Slovenian properties seem to be, so make sure you’re not making it rain with those euros during your stay. Many people don’t stay in the area for as long as we did, so you might not have time to fit in everything we suggest, but you can pick your favourites. 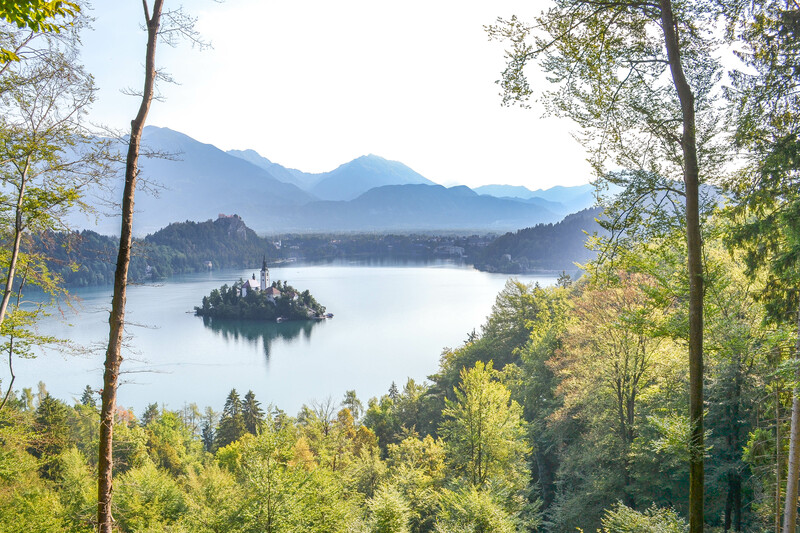 So, here’s our top seven things to do in the Lake Bled. This was our first day vibes. We love a good castle and we also love a good view, so we knew this was going to be right up our street. We didn’t exactly go the easiest way to get there, picking a forest path with sliders on, only to find out there’s some nice solid steps you can climb up later. However, our struggle was rewarded tenfold with the view. There are three different levels of viewpoints once you are inside the castle grounds and it’s truly stunning. As the highest point is on the north side of the lake, it offers incredible views over the lake, including the island with the rolling hills in the background. We loved the different shades of blues captured in these views, it’s absolutely stunning and we were sold from day one. In our opinion this is the best view during the day, and we highly recommend the castle for it. Yet on the other hand, the rest of the castle for us was a little gimmicky. It was something we were sure children would enjoy, seeing metal work made and other trades, but for us it wasn’t what we were looking for. Therefore, after the view (and we spent a long time looking at the view) we had a quick wander round a then headed off – down the steps this time! Now, this was probably our favourite experience while in Lake Bled, and hopefully from the photographs you can see why. We dragged ourselves out of bed just before 5am to make the hour-long trek from our hotel to the view point. Ojstrica isn’t the highest view point in Lake Bled, but it’s the best to watch the sunrise over the lake with the island in the centre. It was a rush to get there, we were lazy and didn’t quite get up early enough to have a leisurely walk to the Ojstrica. Most the time we were power walking, sweating and praying that we would beat the sun. And luckily, we did. We hauled ourselves up the final few rocks and there is was, in all its glory, just beginning to peak from behind the mountains. Now, you know the moment in Lion King at the beginning on the movie where the sun starts to rise and you here the shout of ‘Nants Ingonyama Bagithi Baba‘, it was like that, just as magical and just as exciting. Plus, we were lucky enough to have a pretty clear sky that day and the sun came up like a gold shimmering coin. We ended up staying there for two hours just watching the sun rise higher and higher. It truly was the most stunning location we have ever watched sunrise from. This is our number one must do when in Lake Bled. We got there for 6am in August, but make sure you check what time sunrise is on your trip. If you still haven’t seen enough amazing views of the lake then there’s another view point called Mala Osojnica, which is to the south of Ojstrica. This is a much longer trek and something we wouldn’t recommend doing for sunrise as it is quite shaded in the trees. However, Mala Osojnica is higher than Ojstrica and the opposite side to Bled Castle, so if you’re up for the challenge, we’d say it’s worth the hike. This is just a must do. To be honest it is quite expensive, it’s 20 Euros to hire a row boat for an hour pretty much wherever you go around Lake Bled, and yes, it’s also a little cliché, but we have to say it’s so fun to be out on the water. You’re able to row around the island, to the other side of the lake or just relax and bob around. Although, don’t pretend you know how to row if you don’t. We learnt the hard way… trust us! While we were there it was hot, oh it was so hot, and after long walks all we could think about was jumping in the lake. One thing that surprised us, and we are sure there is some scientific explanation for this, is that the water was so warm compared to when you swim in the sea. It was refreshing, but not so freezing that you have to jump out thirty seconds later. There are a few designated swimming areas around the lake, however most people pitch up pretty much anywhere around the north, west and south sides and jump in. Don’t do this on the east side though, you’ll get told off if you do it on the east side. One day we were exhausted and decided we were going to walk over to the north west side of the lake and spend the day sunbathing and swimming in the lake. One of the best decisions we’ve ever made. One thing we didn’t do was swim to Bled Island. On our first day we got a boat over but in hindsight we wish we had swum. In our opinion there isn’t much on the Island, we had a quick wonder and got an ice cream, but if we swam we feel like there would be more purpose and achievement. Although if you do that, you can’t go in the church because you would be dressed a tad inappropriately… swings and roundabouts. However, when we go back, we’ll definitely be going for a swim. Our day trip to Lake Bohinj was one of our favourite days. It was beautiful. Larger than Lake Bled and not as ‘pretty’ in the conventional way, yet bold and imposing. Lake Bohinj is only a 40-minute bus journey from Lake Bled and it can drop you off at the east or the west side. We opted for the west. Our plan was to get all the hiking done in the morning and then relax in the afternoon. The first sight on our hit list was Slap Savica, a waterfall up in the mountains. It was just over an hour’s hike with who knows how many stairs at the end. The hike itself was beautiful, and the higher you got you could see little sneak peaks of how amazing the view was going to be through the trees. However, were not going to lie, the waterfall was a tad disappointing. Maybe because were used to finding waterfalls in India or South East Asia and normally their health and safely is somewhat relax, but all we were looking forward to during the hike up was jumping in plunge pool and cooling down. Nope. You couldn’t even get anywhere near the pool let alone jump in! Plus, it was only a trickle, nothing which was going to throw you under the water. If we’re being honest and we went back to Lake Bohinj, this is not the hike we would pick. There are many more hikes which we believe would give you a lot more in return, like the Seven Lakes Hike. However, after our roughly three hours round trip to Slap Savica we wanted to spend time relaxing by the lake. We had heard that the north side of the lake was the prettier of the two because on the south there is a road which runs the whole way along. So, we started our trek along the north. What people clearly forget to mention is that the north side of the beach is also the nudist side. We don’t have a problem with nudist beaches at all. If you have the self-confidence to let it all hang out then be our guests, however, a heads up would be appreciated. For the rest of the day we lay on the shore and bobbed around in the lake. It was perfectly beautiful and a must do when in Bled if you have enough time. We were considering staying here for a few days in itself the next time we visit. This place is stunning. The only hiccup there it’s a nightmare to get to. Only two or three buses run a day to get there and the shuttle bus only once an hour. It’s not the easiest, but luckily as we headed to the bus station there was a little independent shuttle running. Slightly risky business we know, but we got there unscathed. This place is like walking through Narnia. There is a footpath set out and you simply walk and walk and walk, with the sheer rock faces on either side and the rapids of the water below. When we first got there, we stuck to the path, no one else was getting off to actually walk down to the water, so we thought that we would get told off if we did. But then, out of nowhere, one brave soul jumped off the path and walked down to the water and it was like a ripple effect. By the time we had walked to the waterfall at the end everyone was enjoying the maybe prohibited fun. On our way back from Vintgar Gorge we weren’t as lucky with the transport as we were on the way there. So, we resigned ourselves to an hour and a bit walk back. Originally, we weren’t chuffed about it, we had been up since 5am and walking pretty much ever since, but that was until we really started to take in our surroundings. Lake Bled is amazingly beautiful, yet it’s also quite busy. So, when you’re in the town everything is quite packed in, but not out here. There were rolling hills, wide open meadows and cute little wooden houses nestled in between. It was like walking through a set of the Sound of Music. This was one of our favourite walks in the end; firstly, because it was mainly downhill – winner, but secondly because it was so unexpectedly beautiful. Moral of the story, if you miss the shuttle from the Gorge, just walk. You won’t regret it. Looks fantastic, it was already high on my list and now it’s even more so!